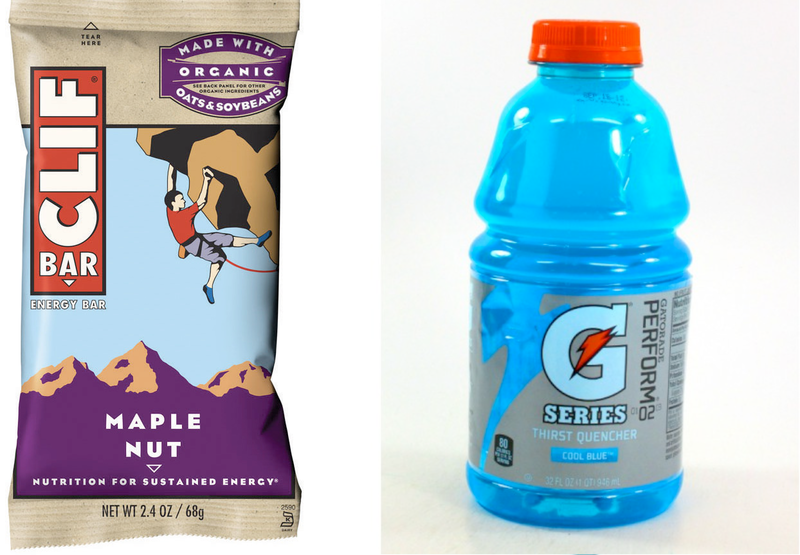 The Clif Bars are loaded with protein and carbs – great energy boosts; and the Gatorade has enough electrolytes to keep my stamina up while keeping my mind focused on the day ahead. I also purposely cut down on my coffee intake [from about 3 cups a day to 1 in the morning before I get to work]. I replace my coffee urges with orange juice in attempts to prevent the inevitable “after I’m done pushing myself I get sick” situation and to avoid the dehydration that accompanies being over-caffeinated. The adrenaline is enough to keep me going without the caffeine. Maybe you think Clif Bars taste like dirt and the thought of drinking something blue makes you queasy. It doesn’t matter, just know what will keep you going when you need it before the day starts – or you may be subject to the $0.99 Pizza on the corner because you have no time to figure out what you want to eat. Then you feel like a tired ball of greasy dough and have even less energy than before you ate. Know your fuel so you can recharge without missing a beat!